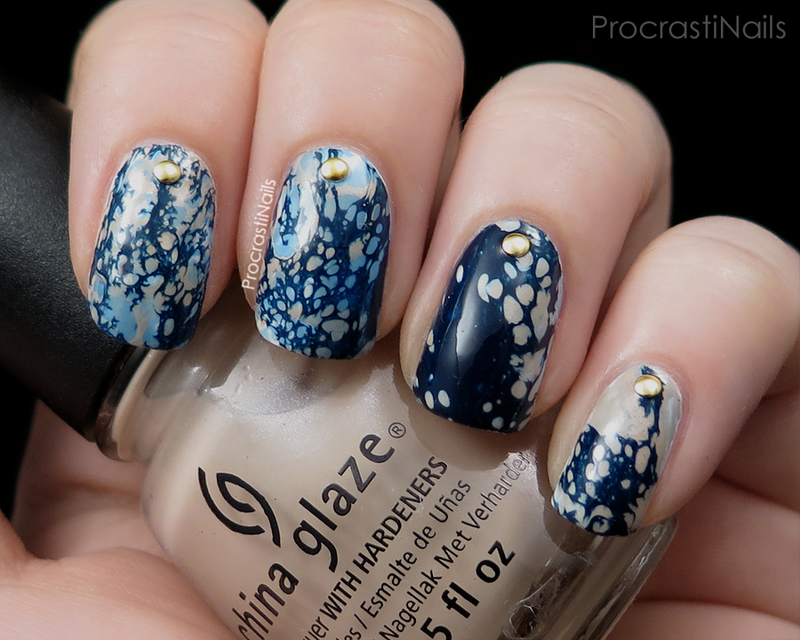 I finally got to try my hand at some water spotted nails, and boy am I happy with how they turned out! This is a technique I've been wanting to try for ages now but I never seemed to have the time or the right materials to sit down and figure out how it worked. I was worried it was going to be a pain for me in the same way that water marbling is - something everyone else seems to find so simple but that fights me every step of the way. I was really happy to find out that wasn't the case. In fact, I'd say water spotting is one of the easiest techniques I've ever tried! Woohoo! 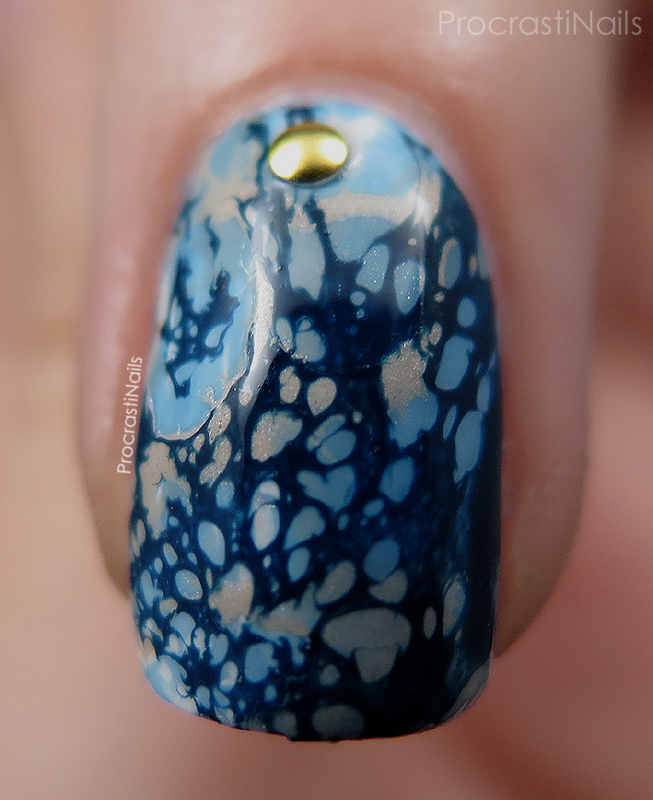 The basic idea with water spotting is that you spread a few drops of polish on the surface of the water (similar to a water marble but only with one colour at a time) and then you spray it with an alcohol-based product to get the polish to pull apart, and then dip your nail in (again just like a water marble). Repeat as many times and with as many colours as you like! To spray the surface I mixed rubbing alcohol with a bit of water in a spray bottle I got from the dollar store (you can also use hair spray but I didn't have any that were non-aerosol). For this look I used a base of Essie Blanc and then did layers of China Glaze Electric Beat, China Glaze Don't Honk Your Thorn and Julep Michelle. I sealed it all with two coats of Seche Vite just to make sure it was smooth. What I really like about this technique is how unique and organic (is that a weird way to describe nail art?) each layer ends up being... You can't really control how your spritz will impact the polish so you just have to trust it to work out. This is definitely a technique I'm going to be doing more of in the future. It was so simple and it looks AWESOME in the end. I'm already picturing how great it would look with neons and black for a bold summer look. Hmm! Let me know what you think! 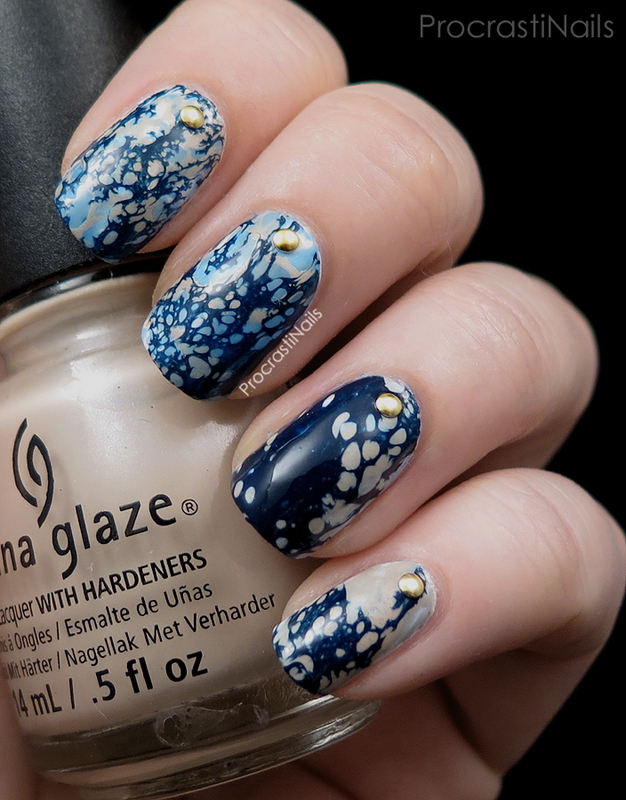 Have you ever tried water spotted nails before? What did you think of the technique? That's funny! Organic is such an odd nail art word but yeah that's what came to mind for me too! 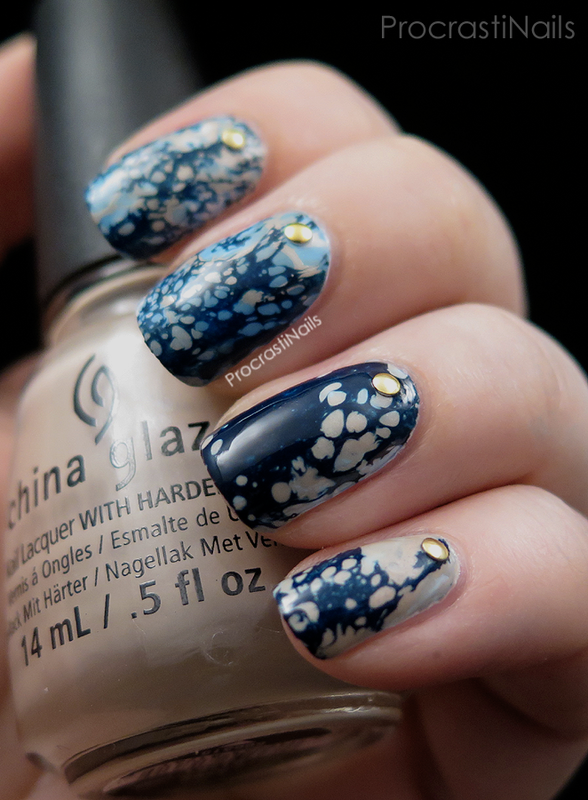 What a neat effect on the nails! I haven't tried doing a spotted manicure but I want to now. It's really easy, I can't wait to see what you do with it Lisa! This turned out amazing!! I can never get mine to look that! Thanks! I was surprised at how well they turned out, to be honest! I've never seen this before, beautiful! Holy awesome! These turned out beautifully! That looks SO good! I still need to try this technique.. hopefully soon! Gorgeous! I love how with techniques like this, each nail comes out differently. I really need to try this! This turned out so well! Almost has an almost "demin" feel to it!! I've always wanted to try out water spotting but seeing how well it turned out for you gives me the shove to do so! Great job!! Like you this is a technique I've wanted to try but never have the right stuff on hand. This turned out so pretty and I love organic as a way to describe it! Does it make a difference using aerosol or non aerosol hairspray then? This is stunning! My water spotted nails never turn out. Everything I tried just didn't work. So cool! The gold studs give it an extra edge!